It’s time for the June edition of Emails That Do Work, the blog series where we dissect some of our favorite user emails, and talk tips on how to optimize our own. Our first email is brought to us by Savannah Chop House, a contemporary American restaurant. We’re starting with this particular piece because it contains one of, if not the, most important aspects of an email that does work: flow. 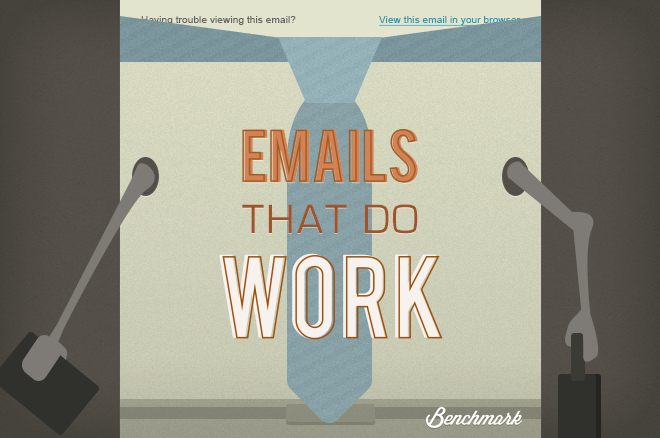 There is no such thing as an email that flows too well, but they can definitely not flow enough. Savannah Chop House sets a great example on how to ensure your email flows visually and even incorporates their own kitchen theme. In addition to making me terribly hungry, this restaurant gets a 5 star review for this piece of artwork. Pattern flow: Instead of a solid background, Savannah Chop House chose a kitchen style tile pattern that takes the eye from the top to the bottom of the email within seconds, almost like a game of Tetris. Patterns are always useful (and fun!) for backgrounds, as long as they don’t take any attention away from your content. Color flow: On top of the tiling, they use different shades of gray to columnize various sections of content and solidify the email as one. Next up, we have the Southern Nevada Golf Association (SNGA). For a background-less email, this piece uses its content to the fullest extent. It’s common to see email marketing users try to squish every piece of information they want to include into one email, usually resulting in it being way too long or extremely text heavy. Perfect text-to-picture ratio: For every picture or video, SNGA places the ideal amount of text around it. They display the first one or two sentences, followed by “...Read Story” hyperlinked to the full story on their website. We want more, we want more! 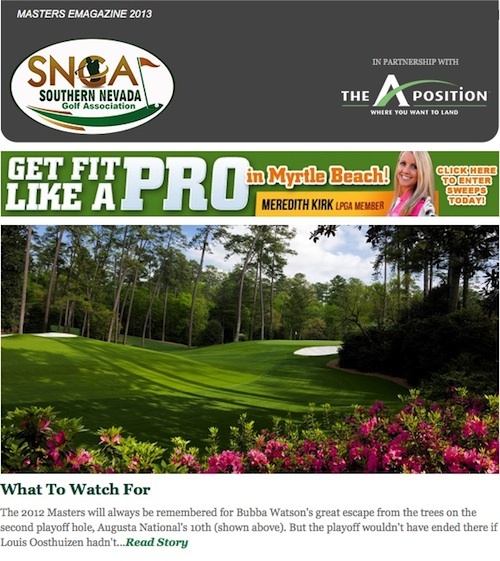 : Take a tip from SNGA and sum up your story with a killer headline, an entertaining intro and a link to the full article. Not only will this keep readers engaged and interested in your email as a whole, it’ll increase the traffic on your website. Two birds, one stone. Why not? The third email comes from Small Business Expo, the largest nation-wide B2B trade show, conference & networking event for small business owners. This design reminds users exactly how customizable the Benchmark tool can be when you think outside the box and explore all of the options we offer. At first glance, it’s as if the email is one giant picture, but look again. Simple yet stunning: Although graphics can dramatically enhance an email, white space is a beautiful thing when used correctly. This email nailed it. Consisting mainly of graphics, there are enough images to fill space, yet not too many to make it awkwardly busy. Full tool usage: First, Small Business Expo imported their main graphic. Next, they added an additional box to the bottom of the image in order to include more content without breaking up the visual. Using color codes, they matched the exact color from image to box. A reader would never know the image was customized, and that is why this concept is awesome. This email was created by Ty Boyd Executive Communications & Coaching. This piece is memorable for multiple reasons. Although it’s not plastered in images or bright eye-popping colors, it builds a lot of trust with its recurring and new readers. In this issue: This is one of the most inspirational emails I’ve seen, all thanks to the “In this issue” section. Think how often you skim through emails and have to postpone reading them for various reasons. Most would say that’s where awesome graphics come in. Ty Boyd didn’t think so. Highlighting what content is included within the email intrigues readers to either immediately shoot to an article they are interested in, or reminds them to come back and read the story later. Either way, brilliant idea. Branding: Not only does the color scheme match their website, but the button images at the bottom of the site are identical to the buttons on the email. No better way to instill trust and recognition in your readers than branding yourself in everything you produce. Finally, we have Not Just A Label (NJAL), the world’s leading designer platform for showcasing and nurturing today’s pioneers in contemporary fashion. Needless to say, this Benchmark user may be the king (or queen) of layout design. Layout design: Maybe it’s the columns, maybe it’s the images or maybe it’s the glorious white space. Regardless, this page and many others from NJAL take advantage of various types of layout design and incorporate it into one solid email. If the email were broken into sections, the sections even have their own sub-sections. Headlines: Big, bold, italicized headlines. Classy, fashionable and sleek. Regardless of what the headline says, it’s got my attention. Great article. First impressions is the key for any email marketing effort. Only way to grab users is to catch their attention and the examples above do just that.